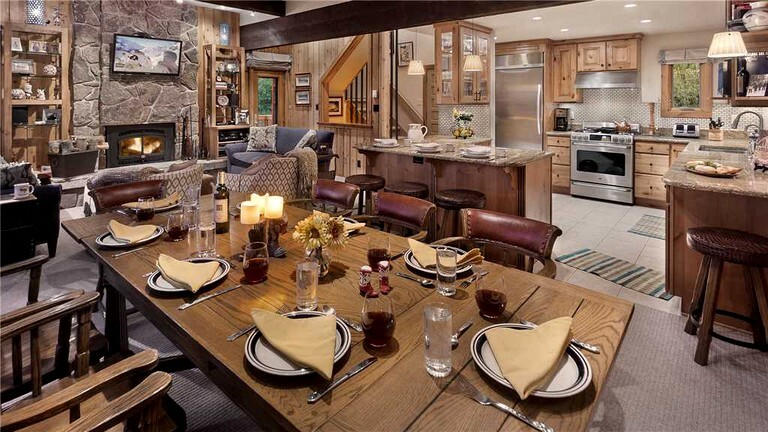 This slopeside vacation rental is located in Steamboat Springs, Colorado, and can accommodate 13 guests for a getaway full of skiing and outdoor adventure. It has four bedrooms and three full bathrooms. The first bedroom features a king-size bed and an ensuite bathroom. In the second bedroom, guests will find another king-size bed that can be split into two twin beds. 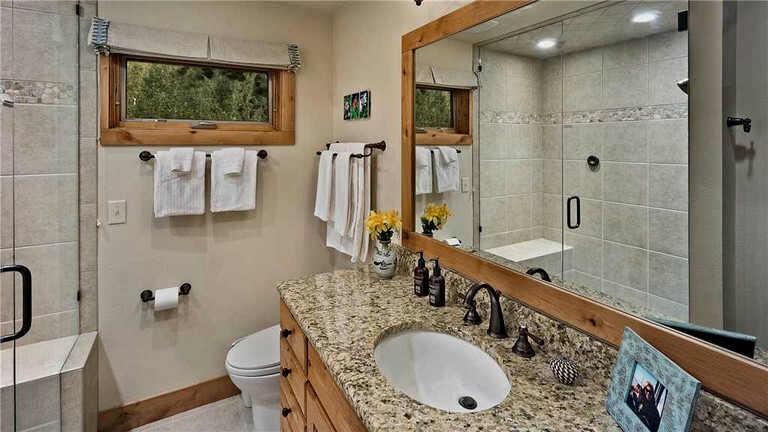 A full bathroom is situated right next to the second bedroom. Both of these two bedrooms provide direct access to the rental's upper deck. 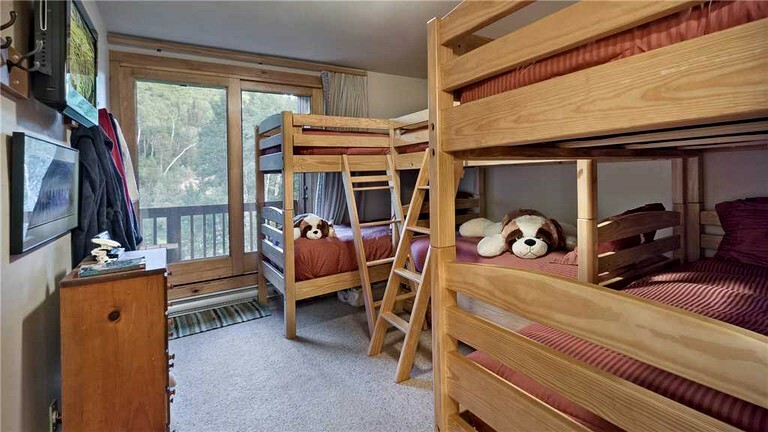 The third bedroom contains three sets of twin-over-twin bunk beds, while the fourth bedroom is furnished with two standalone twin beds. 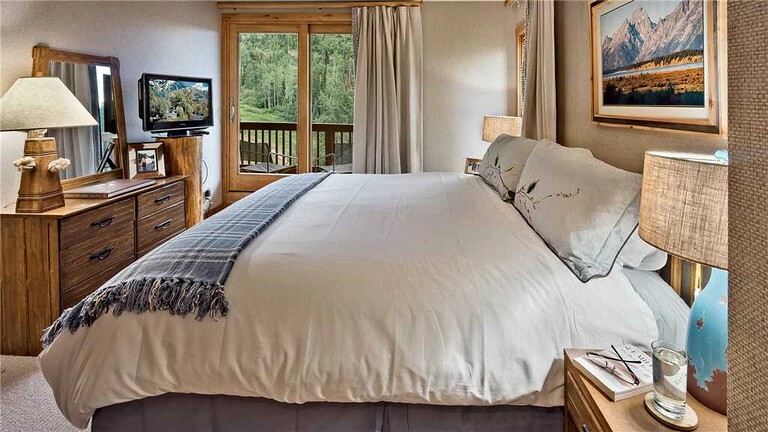 These bedrooms share a full bathroom and provide access to the rental's lower deck. There are also two trundle beds for additional sleeping capacity. In the bathrooms, guests will find amenities such as double sinks, a glassed-in shower, and a combination bathtub/shower. Luxurious towels, plush robes, and soft towels are provided. 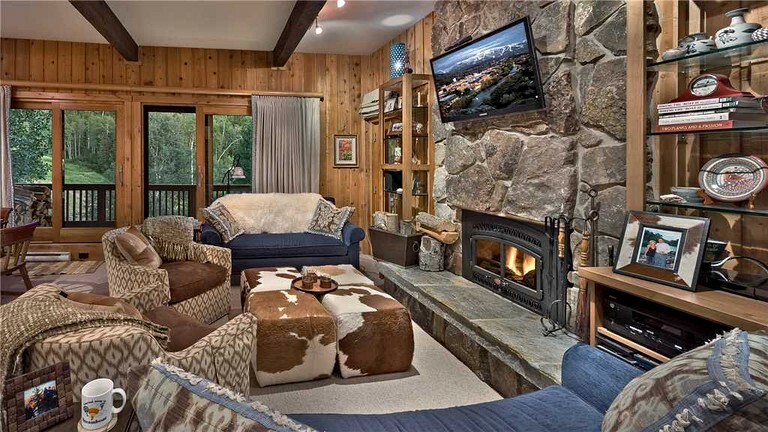 In the living room, guests will find an array of sofas and armchairs arranged around a wood-burning fireplace and a large flat-screen television. The dining area seats eight guests, with seating for another three guests at the adjacent breakfast bar. The fully-equipped kitchen comes with granite countertops and stainless steel appliances, including a gas stove, a microwave, and a dishwasher. 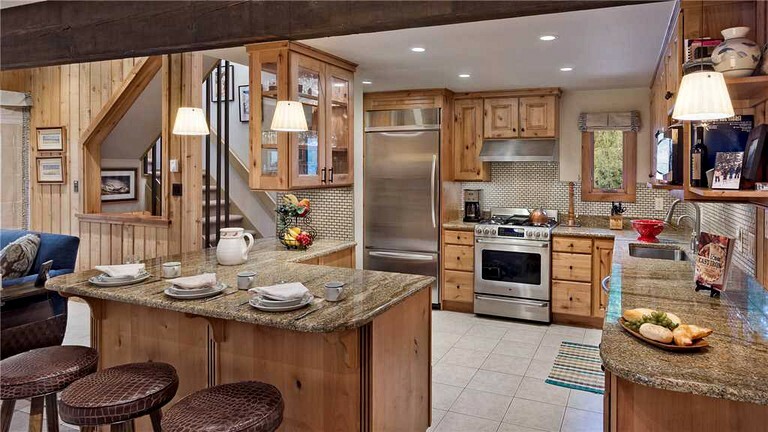 Inside the vacation rental, guests will enjoy amenities such as Wi-Fi, cable television, a wood-burning fireplace, forced air heating, and a washer and dryer. Outside, guests will find multiple decks, an outdoor dining area, and covered parking. Guests will also enjoy shared access to a community swimming pool, gym, and hot tubs. 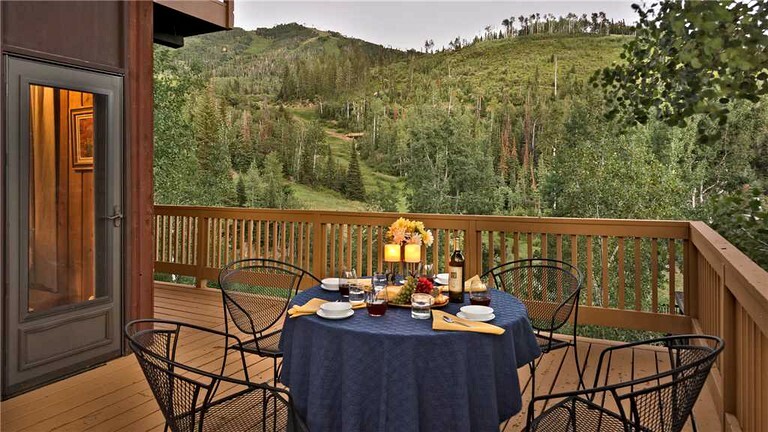 This vacation rental is located in Steamboat Springs, Colorado, where it is situated along the Right-O-Way ski trail of the Steamboat Ski Area. Guests can ski in and ski out directly to and from the trail, and the Steamboat Ski Resort's base is just one mile away, providing convenient access to 165 trails and 2,965 acres of skiable surface area in total. On the eastern edge of Steamboat Springs lies Routt National Forest, which safeguards one million acres of alpine forests, meadows, tundras, wildernesses, lakes, and streams. The forest is administratively conjoined with Medicine Bow National Forest to form Medicine Bow-Routt National Forest, which encompasses more than two million acres of natural splendor in total. The forests are home to an abundance of wildlife, including elk, eagles, foxes, bears, birds of prey, and marmots. Nearby highlights of Routt National Forest include Fish Creek Falls—a 280-foot waterfall around which guests will find hiking trails that lead to both the base and a scenic overlook of the falls, before continuing across the creek and heading five miles to the east, where it reaches the pristine alpine waters of Long Lake. The western edge of Steamboat Springs is formed by the Yampa River, which is bordered by the seven-mile, paved multi-use trail known as the Yampa River Core Trail. The latter provides access to Yampa River Botanic Park and the Emerald Mountain recreation area. At the botanic park, guests will find 40 gardens that are dotted with ponds and sculptures. The recreation area boasts an extensive network of single-track trails, which wind through 4,000 acres of alpine meadows and forests full of aspen trees and lodgepole pines. It is also home to the Howelsen Hill Ski Area, which is the oldest operating ski area in North America. Other local attractions include the Tread of Pioneers Museum, the Steamboat Art Museum, the NASTAR Race Area, Amaze'n Steamboat Family Fun Park, and the many hot springs and natural springs for which the area is named. The latter include Strawberry Park Hot Springs, Old Town Hot Springs, Sweetwater Spring, Sulphur Cave Spring, Heart Spring, and Iron Spring. 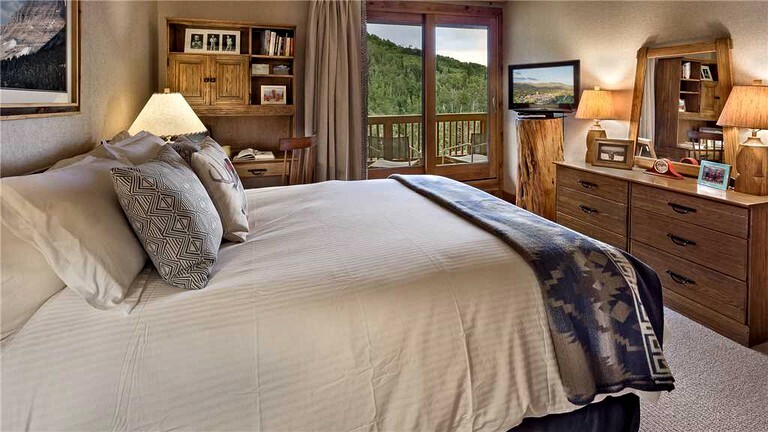 Guests will enjoy an extensive array of year-round outdoor activity options during their getaway to Steamboat Springs. In the summer, guests can explore the surrounding Yampa Valley by foot, bike, horseback, watercraft, zip-line, gondola, or even hot air balloon. In the winter, they can go downhill skiing, cross-country skiing, snowboarding, tubing, snowshoeing, and snowmobiling. In both the winter and the summer, they can enjoy the therapeutic waters of the hot springs for which the area is named, such as Strawberry Park Hot Springs and Old Town Hot Springs. Nearby trails for hiking and biking include the Vista Nature Trail, the Thunderhead Trail, the Mad Creek Trail, the Fish Creek Falls Trailhead, the Yampa River Core Trail, and the various trails of the Emerald Mountain recreation area. Bikers can also head up to the Steamboat Bike Park, where they will find a 50-mile network of trails, which include both multi-directional trails and lift-assisted, downhill-only trails. Horseback rides are available from Del's Triangle Three Ranch and Elk River Guest Ranch. For zip-lining, guests can whiz down six lines ranging from 600 feet to 1,300 feet in length at Steamboat Zipline Adventures. To see the landscape from high above, guests can go on scenic gondola rides at Mt. Werner and go on hot air balloon rides through Wild West Hot Air Balloon Adventures. Guests can go rafting, kayaking, and stand-up paddleboarding on the Colorado River and Clear Creek through local outfitters such as Mad Adventures, Colorado River Runs, and Arkansas Valley Adventures. Other summer activity options include fishing on the Yampa River, swimming at Burgess Creek Beach, teeing off at the Haymaker Golf Course, playing putt-putt golf at Maverick Mini Golf, ascending the 40-foot Kilimanjaro Climbing Wall, and riding the Outlaw—North America's longest coaster. Guests will also find a host of activity options at Stagecoach State Park, which is centered around Stagecoach Reservoir. Here, they can enjoy hiking, biking, horseback riding, boating, jet-skiing, water skiing, swimming, fishing, stand-up paddleboarding, playing volleyball, picnicking, and birdwatching. Fishers may catch a variety of trout and pike, while birdwatchers may spot bald eagles, ospreys, great blue herons, and American white pelicans. For skiing and snowboarding, guests can choose between the Steamboat Ski Area of Steamboat Ski Resort and the Howelsen Hill Ski Area. The former offers 165 trails and 2,965 acres of skiable surface area, while the latter is the oldest operating skiing area in North America. For tubing, guests can head to the Yee-Haw Tubing Hill at the Saddleback Ranch. Snowmobile tours and rentals are available from a variety of local companies, such as Steamboat Snowmobile Tours, Colorado Sled Rentals, and High Mountain Snowmobile Tours. Groomed trails for cross-country skiing and snowshoeing can be found at the Steamboat Ski Touring Center, the Lake Catamount Touring Center, the Steamboat Lake State Park Touring Center, and Stagecoach State Park. At the latter, guests can also go snowmobiling and ice fishing on Stagecoach Reservoir. An accidental damage insurance fee is required.